Let’s start with what I packed for me! I’m taking my Juki TL-2010Q and a few projects in hopes that I’ll have a little time to sew in-between fishing, tubing, and turtle races. I also bought a battery powered sewing machine! I’m going to test it out while riding shotgun. My husband is quite leery of the noise, but I am giddy about the prospect of getting 13 hours of sewing time each way! I will definitely blog about that when we get back! Now on to the boys. My goal was to find activities that will *hopefully* keep their attention for more than 30 seconds! (Thank you Pinterest!) Even though they’re not really quilty related, I thought I’d share the activities with you anyways. 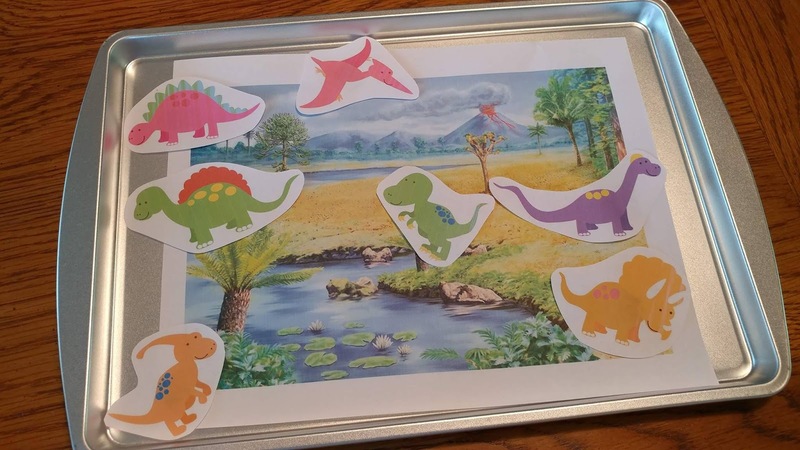 I know many of you have young children and grandchildren, so you might get some new ideas too! There was sewing involved in making a couple of the activities though! First, a little disclaimer. What works for my boys might not work for your children. I tried to gear the activities based around their interests. Even I was surprised by what held their attention over other activities! I've added an update after each idea with how much of a hit it was for my boys. 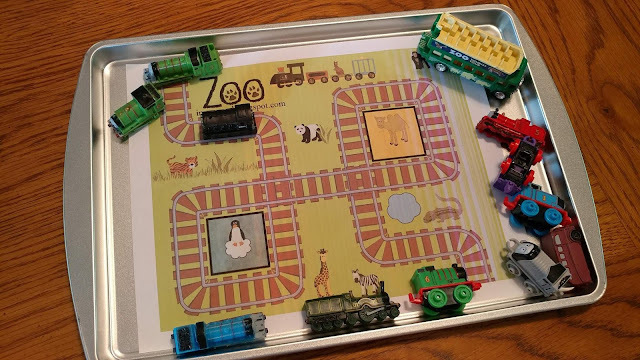 First up is a series of activities that use baking trays. 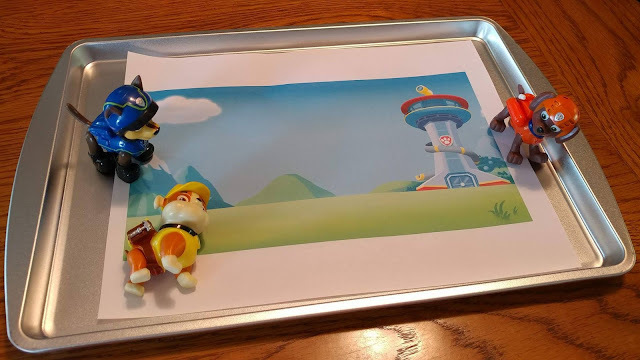 I purchased two cheap baking sheets at Wal-Mart for the boys to use as a lap board. UPDATE: These were worth every penny!! 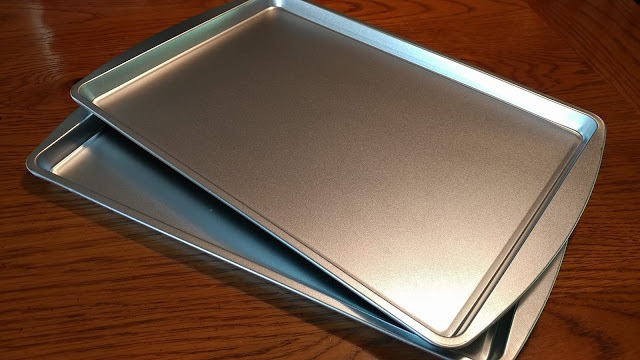 These worked for trays for eating snacks and meals on the go too. 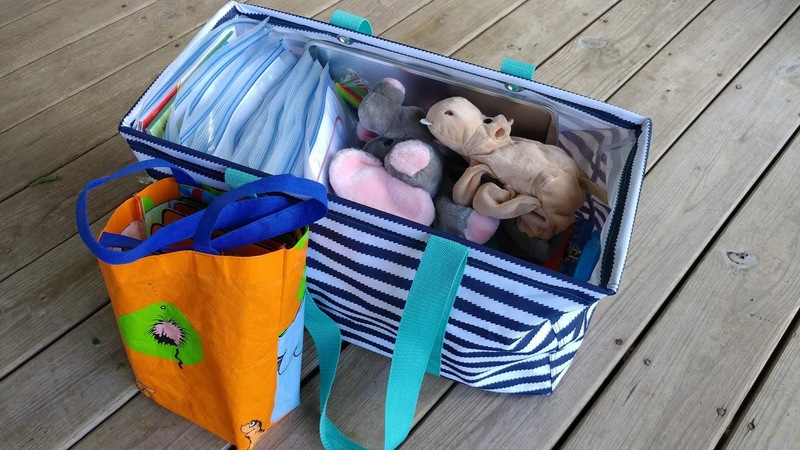 These will definitely be staying in the car with some of the activities for our regular smaller road trips! 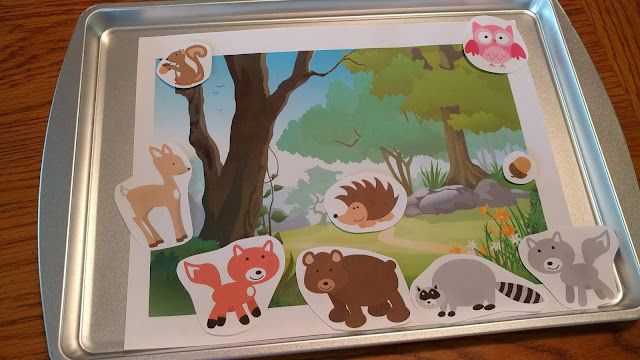 For the first set of activities, I printed several scenes with related animals. I searched Google for images like “jungle scene” and “jungle animals.” After printing, I cut out the animals and attached a small piece of magnet tape to the back. I planned to laminate all of these, but ran out of time. If they survive this trip, I’ll definitely do it when we get back! 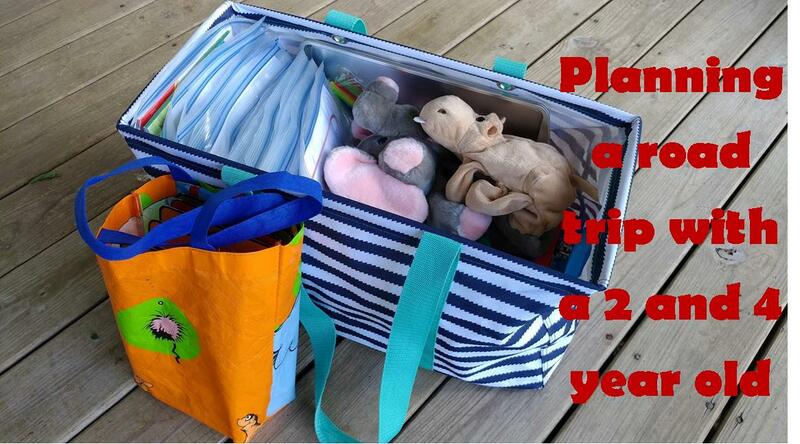 Each set is stored in a gallon storage bag. UPDATE: The boys really liked these! They usually held their attention for a short time (about 10 minutes). 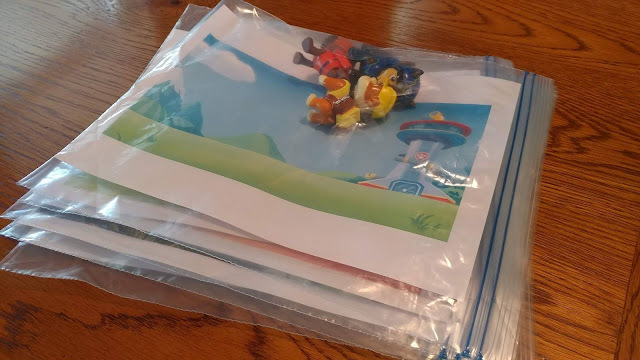 I would definitely recommend laminating them though, as they got crushed in the activity bag. 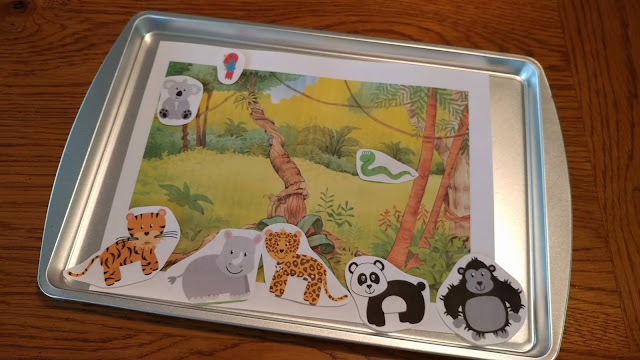 They were really great to pull out in-between other activities and encouraged them to use their imagination. I also printed scenes such as Paw Patrol Tower, an airport, a city, and fire station with a burning house. 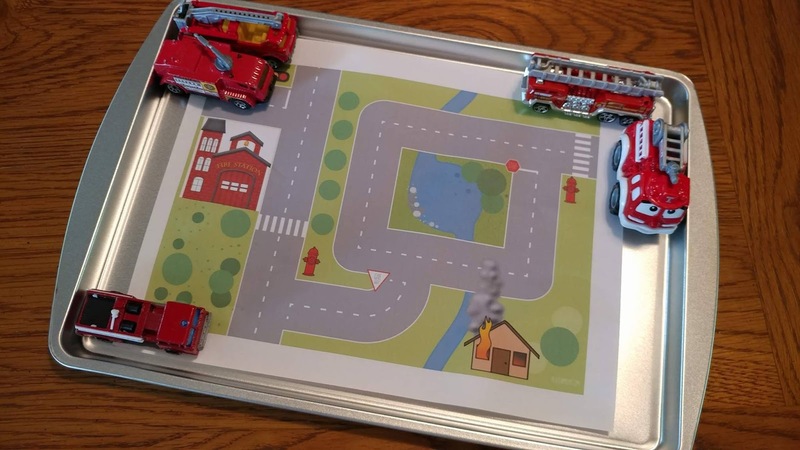 For these, I added toys that we already had on hand like the Paw Patrol dogs and firetrucks. Again, I am keeping each scene and its toys packaged up in a gallon storage bag. UPDATE: These were a big hit! The trains, construction equipment, and airplanes were the favorites! I will definitely be laminating these and keeping them to use again! I’m hoping to space these out and use some of them on the way there and save some for the way home. 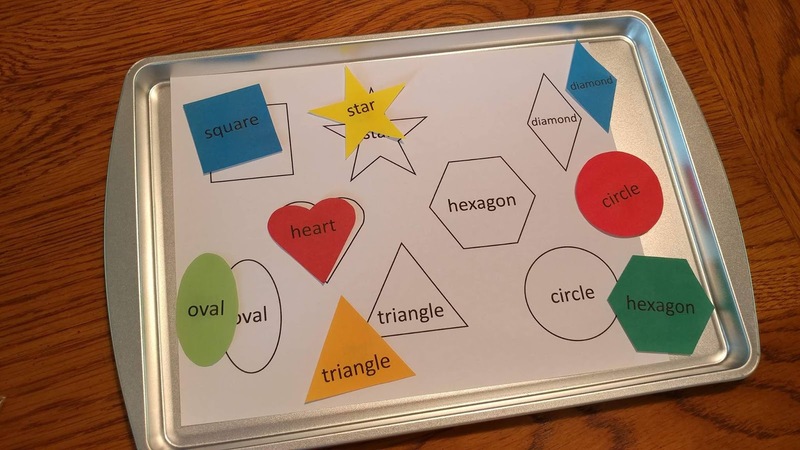 I also made a matching game with shapes. 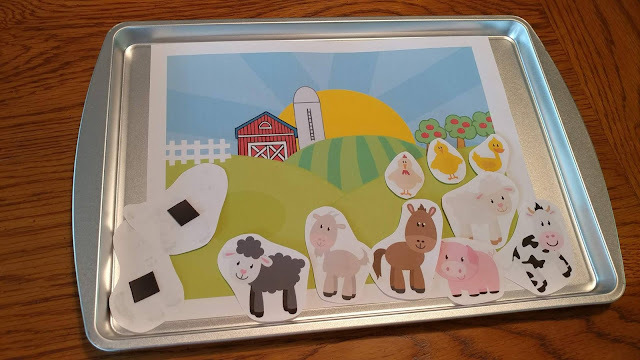 The colored shapes have magnets on the back so they will stay in place when used on the baking sheet. UPDATE: Another winner! Both the 2 and 4 year old liked this one. 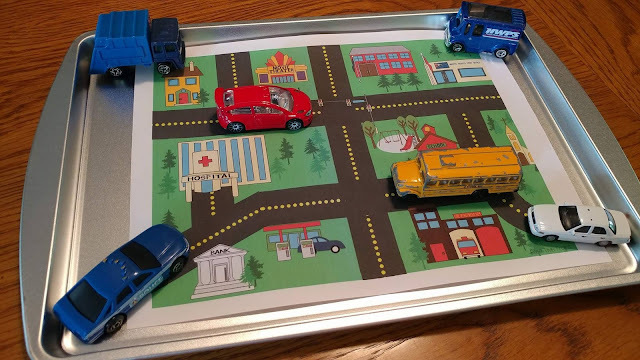 It was a fairly quick activity, but I loved having educational items mixed in with the "toys." The boys didn't even notice the difference! Next up is a marble maze (which involved some sewing!). I have had this idea pinned on Pinterest for a long time! 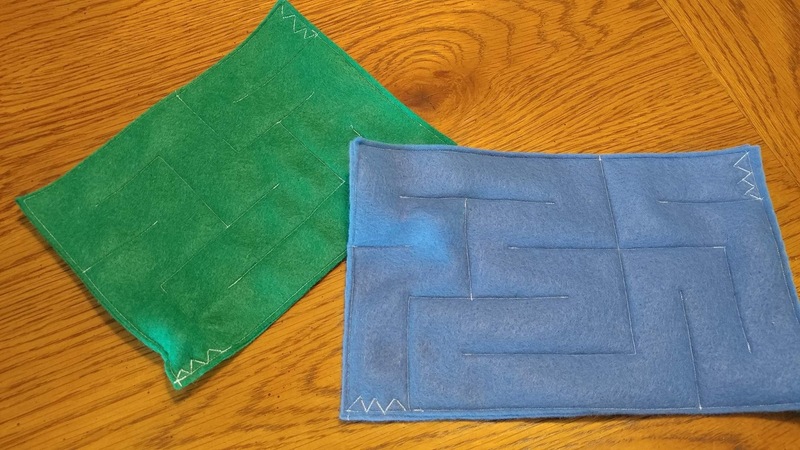 I just stitched a maze design onto two pieces of felt. Before sewing the last side, I put a marble inside. I’m hopeful that these will be a hit with my oldest! UPDATE: These were used several times during the trip! 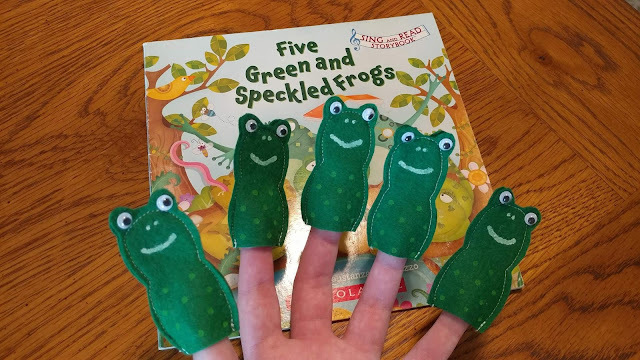 My 4 year old loved them! I’m not a fan of things with a million pieces, but when an idea is easy, I’m willing to try it once. This is just pipe cleaners in a parmesan cheese container. My two-year-old should be able to open the lid, dump out the pipe cleaners, then insert them back through the hole in the lid. Or it might be me picking up 50 pipe cleaners off the floor. Time will tell. 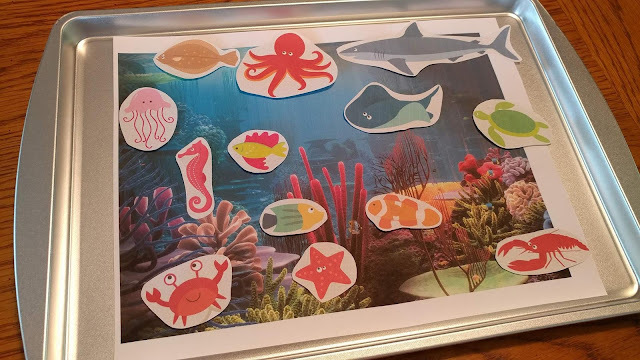 UPDATE: This activity was loved by my 2 year old! He asked for it several different times. And I was shocked to only find one stray pipe cleaner on the floor! The 4 year old wasn't interested at all. 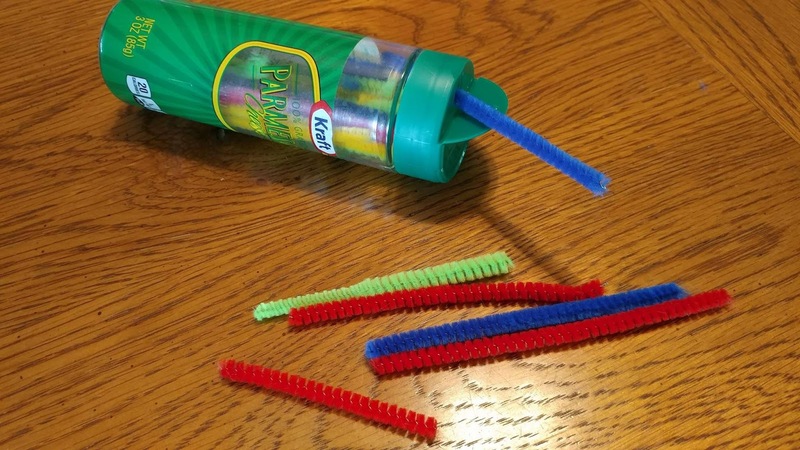 Another pipe cleaner activity, but hopefully less risky. Tiny bits of pipe cleaners in a clear bottle paired with a magnet. 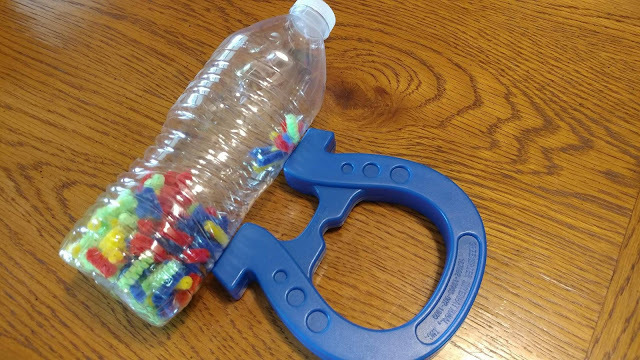 When you move the magnet along the side of the bottle, it attracts some of the pieces (and makes a fun sound too). 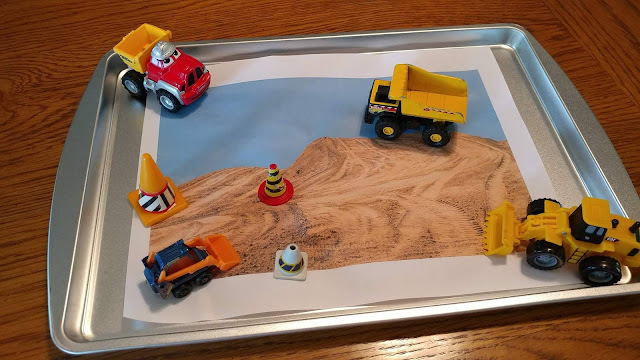 This will be a 5 second activity with my two-year-old, but I’m hoping the science of it makes it last much longer with my four-year-old. UPDATE: Another hit for the 4 year old! I think I will expand on this idea and make a set of magnetic items in bottles (nuts, screws, paperclips, etc). This held his attention far longer than I expected. I wanted to sneak in some educational activities too. 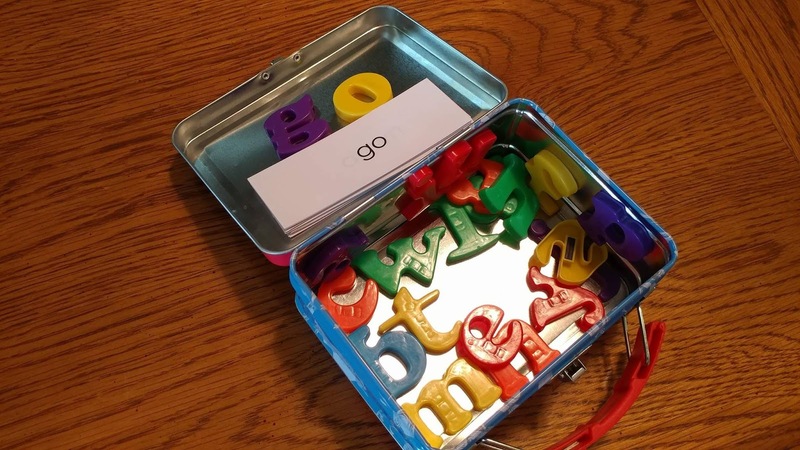 First is a mini lunchbox tin with some magnet letters and sight word cards. (For the four-year-old.) The letters fit on the lid, or will work on the baking sheet too. UPDATE: This wasn't as much as a hit as I wanted it to be. Definitely too advanced for the 2 year old, and the 4 year old just wanted to sort the words and look at the pictures (I put a clipart image next to some words). I want to keep this around though to encourage my 4 year old to keep trying. I threw some time flashcards and a Judy clock in a baggie. My four-year-old loves playing with the clock. 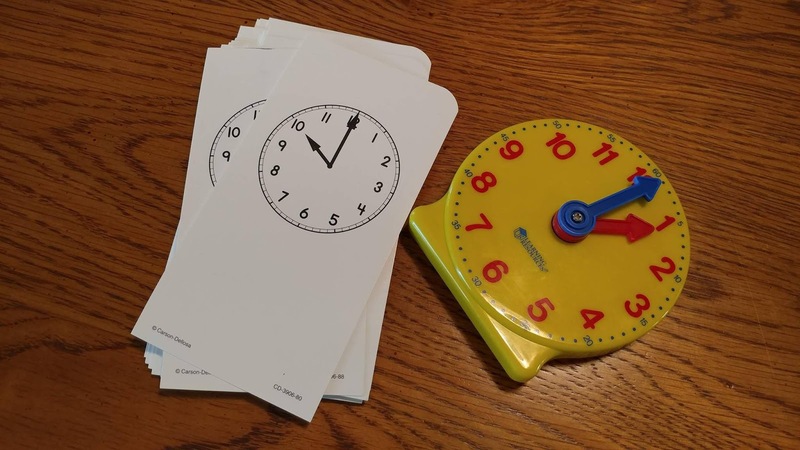 This will hopefully be a way to work on telling time independently for him. UPDATE: A winner! My 4 year old played with this multiple times! He loved being able to "check" the time by looking at the back of the card. My 2 year old played with the clock a couple times, but it was short lived. 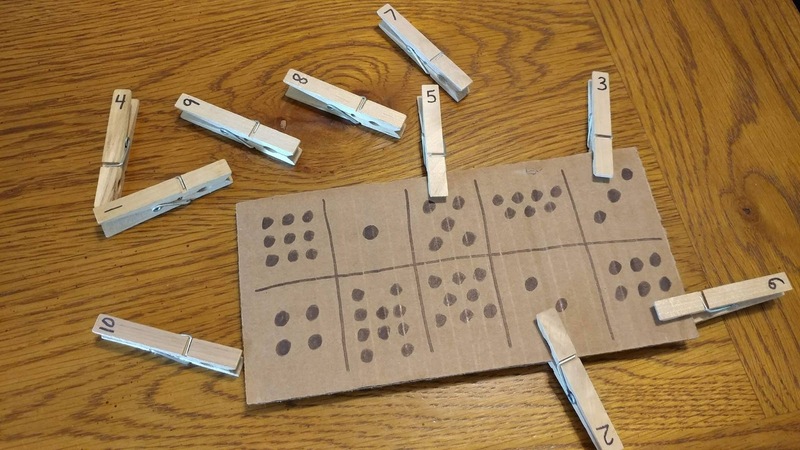 This activity is two-sided. 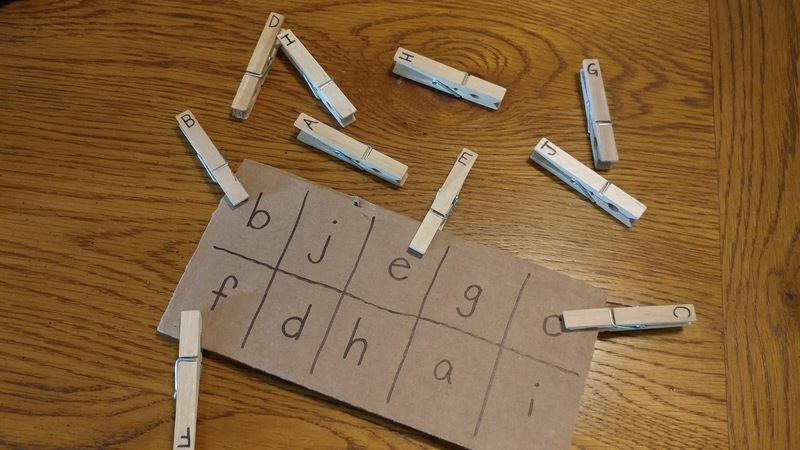 One side of the cardboard has lowercase letters which match to uppercase letters on the clothespins. The other side of the cardboard has dots that match to numbers on the flip side of the clothespins. UPDATE: Not a hit. Neither the 2 or 4 year old liked this one. I think it's because the clothespins are difficult for them to open. I made two variations of this letter matching activity so both of my boys can be successful with it. 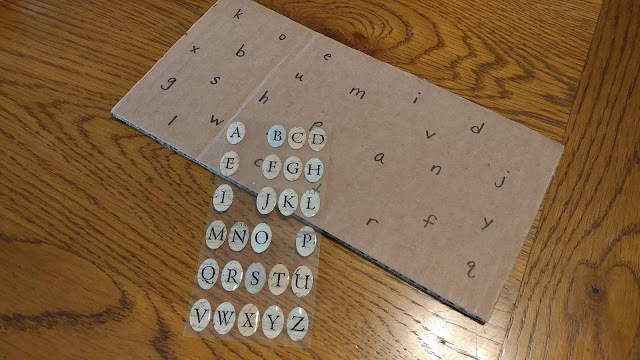 I used a piece of cardboard to write the lowercase letters on, which match to a sheet of uppercase letter stickers. For my oldest, he will get the letters on an empty tape roll. It adds a little more challenge that the younger one isn’t ready for yet. UPDATE: Both the 2 and 4 year old liked this one! They even traded half-way through so they could work on the other one! However, the stickers didn't stick well to the empty tape roll. 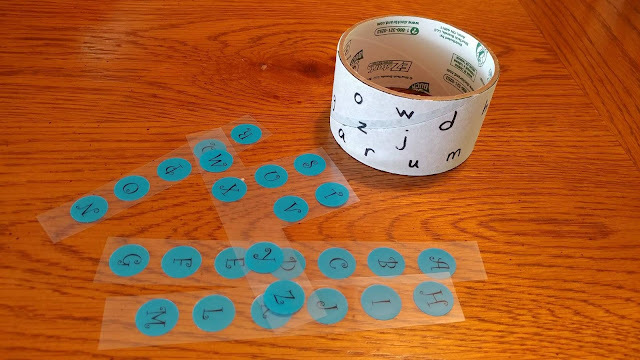 I'll do this one again, as it held their attention for quite awhile, but I'll have to find different stickers or a different type of cardboard roll. 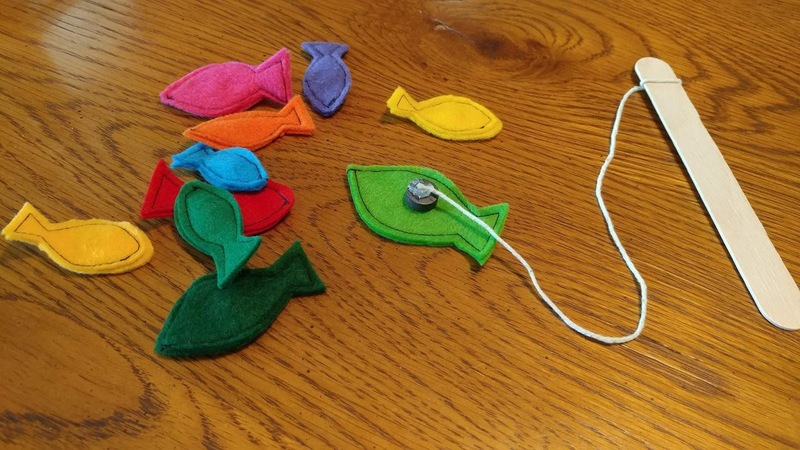 Next up is a mini fishing game (that involved some sewing!). I stitched two layers of felt together with a tiny nut inside from the garage odds and ends bin. Then I tied a string to a popsicle stick and hot-glued a magnet to the end. This should be a fun challenge while the car is moving! UPDATE: A huge hit! Both the 2 and 4 year old loved this one! The magnet stuck to their tray too, so they enjoyed the challenge. They've already asked for another fishing pole. I think I'll keep this one in my purse for something to have when we're waiting a bit. 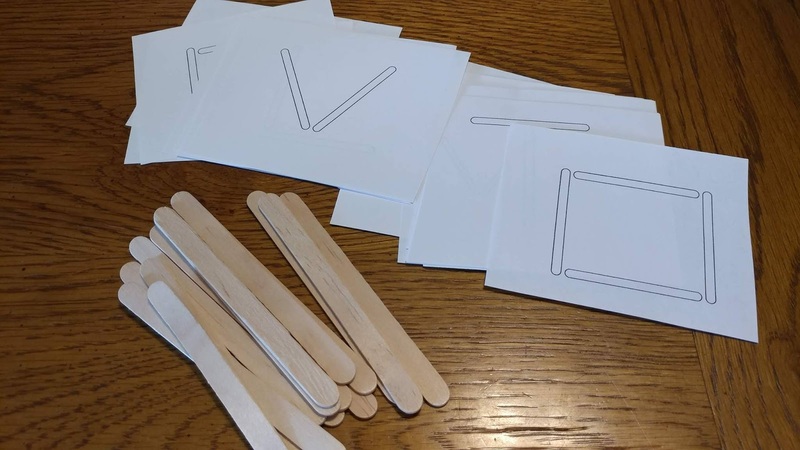 Popsicle sticks and shape cards. I just made up the shapes and printed them out. The cards include letters, common shapes, and some challenge cards that use more sticks and have more detailed designs. UPDATE: This actually got buried in the activity bag and we didn't do it! 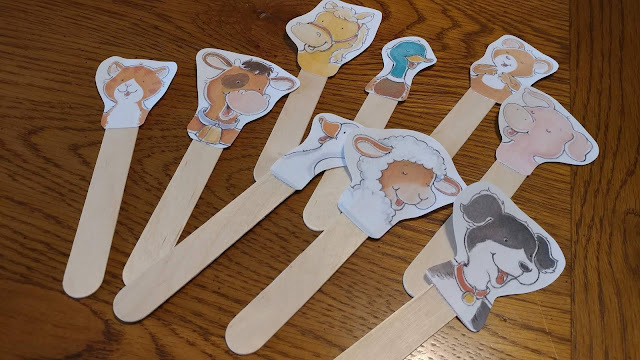 After the trip though, I think I will put tiny bits of magnet strip on the back of each popsicle stick to keep them in place on the tray. This will be the first activity I pull out on our next mini road trip! UPDATE: My 4 year old loved this one! He played with them several times! 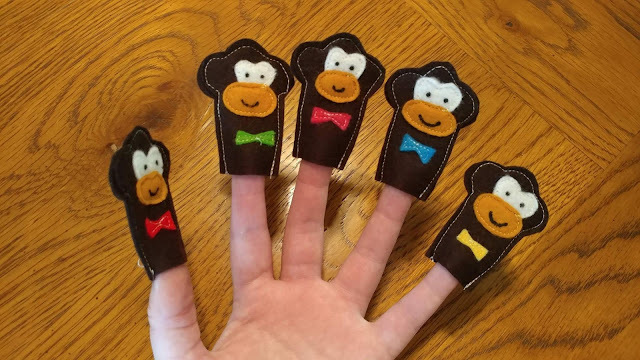 This set of finger puppets required some sewing! The frogs go with the story “Five Green and Speckled Frogs.” My oldest can retell the story as he goes through the book. UPDATE: This got oohs and ahhs from the backseat from both boys! 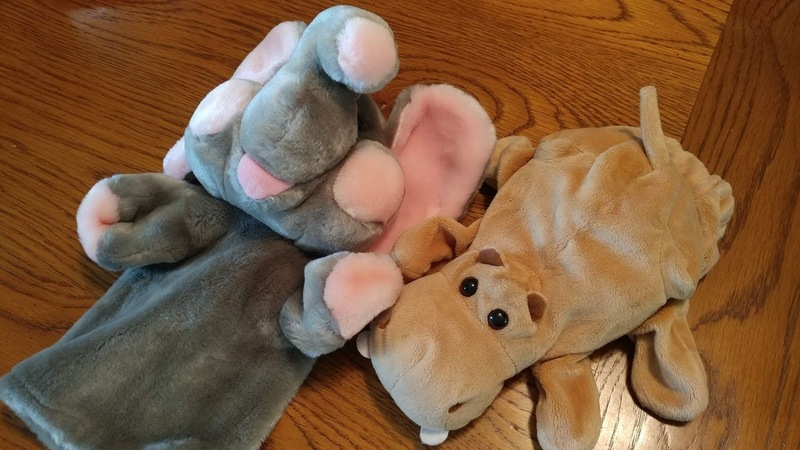 They loved these! However, my 2 year old quickly started removing the googly eyes. Definitely worth the effort to make them though! UPDATE: Another hit! Even the 2 year old would recite the "monkeys jumping on the bed." I was glad all the parts were sewn down so he couldn't pull anything off too! We did buy a couple regular puppets (new, never seen before, just got them in the mail this week and hid them). The novelty of them should entertain them for awhile. UPDATE: Both hits! We had to use these a couple times to entertain them when nothing else would work! 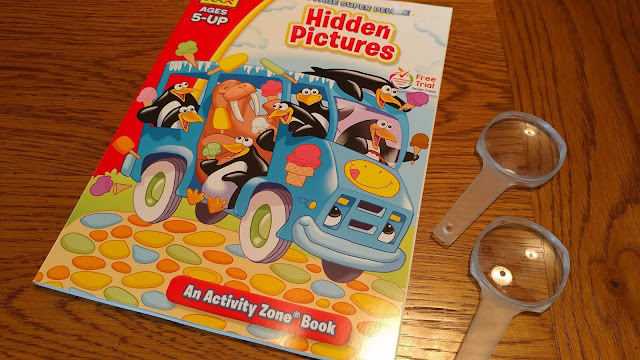 We also got a new Hidden Picture book. I tossed in a couple magnifying glasses to make the hunt more fun. UPDATE: My 4 year old liked this one a lot! We will be putting this into our regular travel bag! 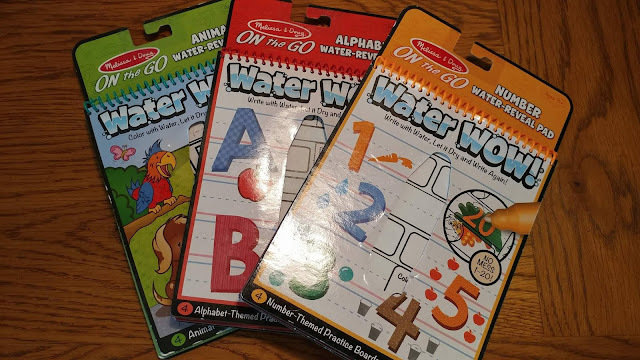 Have you seen these Water WOW books? You fill the pen that comes with them with water, then when you write on the picture, it magically shows color. Once dry, the color disappears and you can do it all over again. We have a few different ones, so I threw them in. UPDATE: These were good to have. The boys like them, and they did them a couple times. I think I'll look for a few more to add to our rotation. 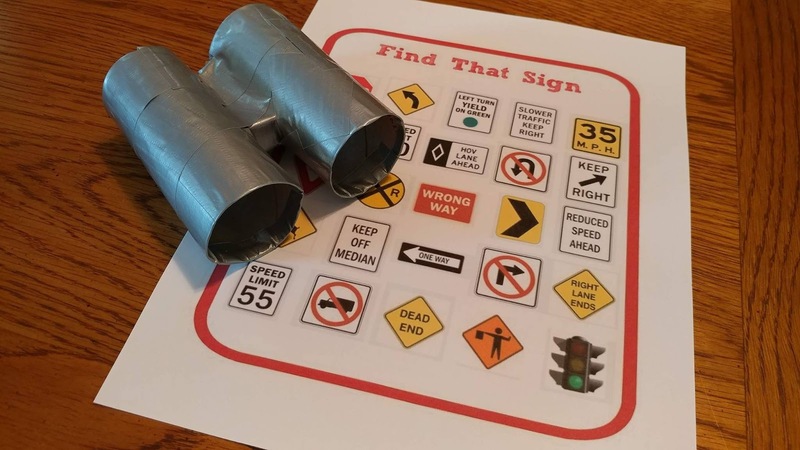 I used toilet paper tubes to make a pair of binoculars for a road sign spotting game. I’m sure there will be a fight over the binoculars. But we haven’t used enough TP for me to make a second one. UPDATE: A definite hit! The boys weren't really able to find a sign and match it to the paper (maybe because we had lots of rural driving), but they loved the binoculars. They used them to look out the windows at clouds, cars, etc multiple times. I threw in a couple extras too. 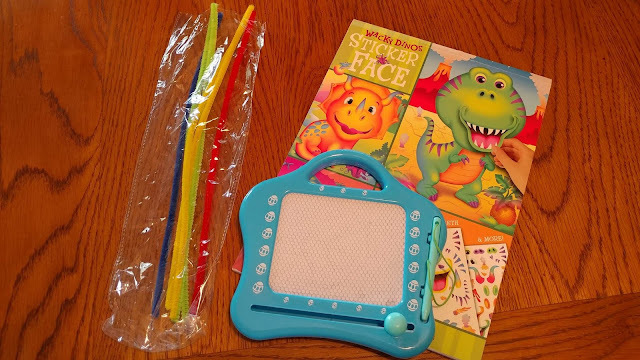 Some leftover pipe cleaners, a magnet doodle board from the $1 section, and a sticker book. UPDATE: The pipe cleaners were good to have in the bag. The boys enjoyed playing with those a couple different times. However, the other activities weren't "new" so the boys weren't interested. All in all, I have about 34 activities packed in tote (well, a second one for the Water Wow books). This doesn’t count the big bag of books or the big bag of snacks either! UPDATE: I went through all our books and picked out the ones that were related to vacation and fishing to take with us. This turned out to be wonderful! On the way there, it helped the boys to prepare for what we would be doing. On the way home, they would talk all about the things we did on our vacation. Hopefully we all have enough things to entertain us for the long car ride ahead! I’ll be sure to update this post after our trip to let you know which activities were the favorites! 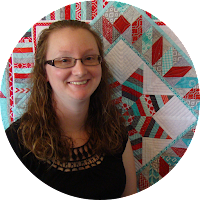 Linking up with Main Crush Monday at Cooking Up Quilts, Let's Bee Social at Sew Fresh Quilts, Wednesday Wait Loss at The Inquiring Quilter, Needle and Thread Thursday at My Quilt Infatuation, Finished or Not Friday at Busy Hands Quilts, TGIFF at Pretty Piney, and Finish It Up Friday at Crazy Mom Quilts. 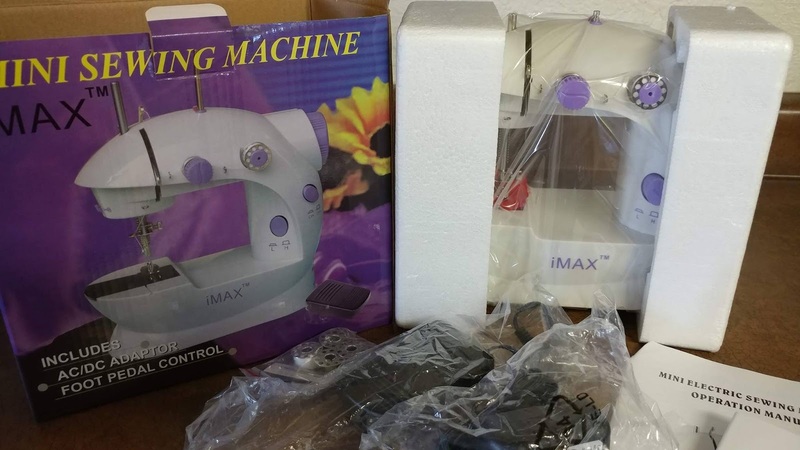 I am really excited to hear about how the battery powered sewing machine works for you. You sound really prepared for the boys; I hope everyone has a great time on the trip! I love this post!!! You should publish this, all the ideas are great and sadly they're 30 years too late for my boy but just in time for the granddaughter. I'm definitely pinning this. Thanks so much for sharing and also I can't wait to read the post about the battery operated sewing machine; I've been wanting to buy one. Have a fun and safe trip and I hope you get some sewing time. Wow! That is surely a lot of activities! I do hope that it works and they are entertained and you can sew! Love that little machine-it will be fun to hear how it all worked out. I nominate you for road trip mom of the year! And road trip machine piecer of the year! It's fun just reading about all the activities you have planned. Have a great trip! I have no little ones at home anymore, but my granddaughters will be here next week. I ordered the water Wow books. What a great idea! Good luck on your trip! Hope the 13 hour trip includes a nap for you and the boys. 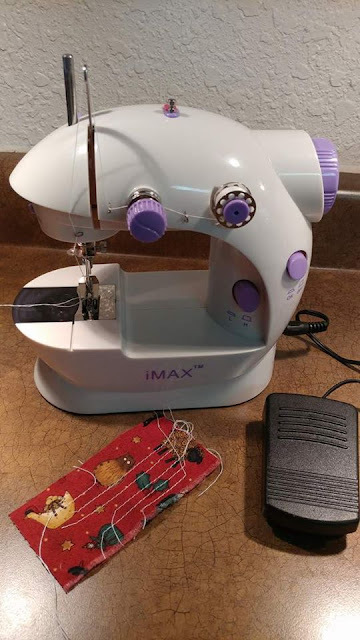 When I saw the little sewing machine on Instagram...I screamed a little with delight! OMG! I had no idea they made such a thing and cannot wait to hear how it turns out with traveling. I wonder how long the batteries will last?! 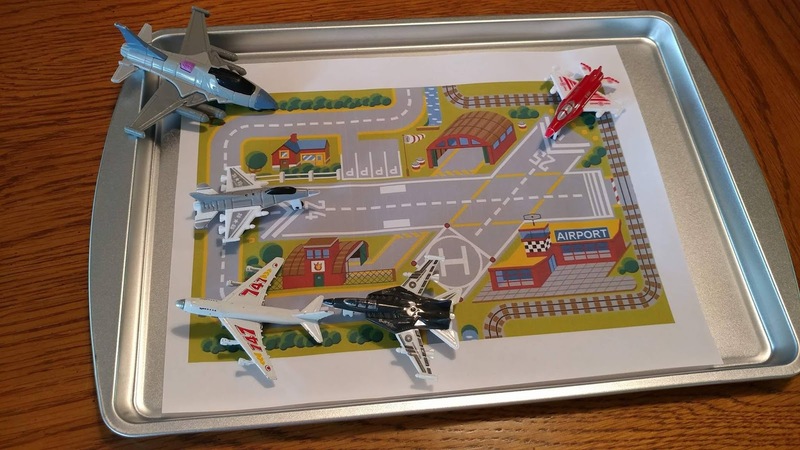 Tons of activities to keep your boys busy! SO much fun in my eyes! Well thought out on your part!! Wow! What lucky boys! 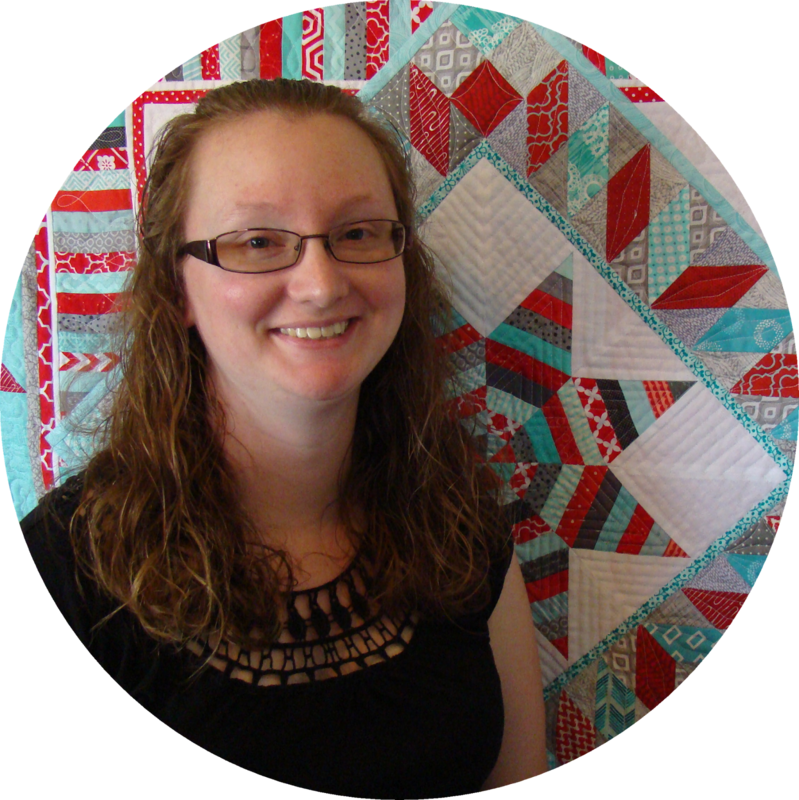 Your creativity obviously goes waaay beyond your beautiful quilts! I'd say you have definitely earned your quilting time. Wow! 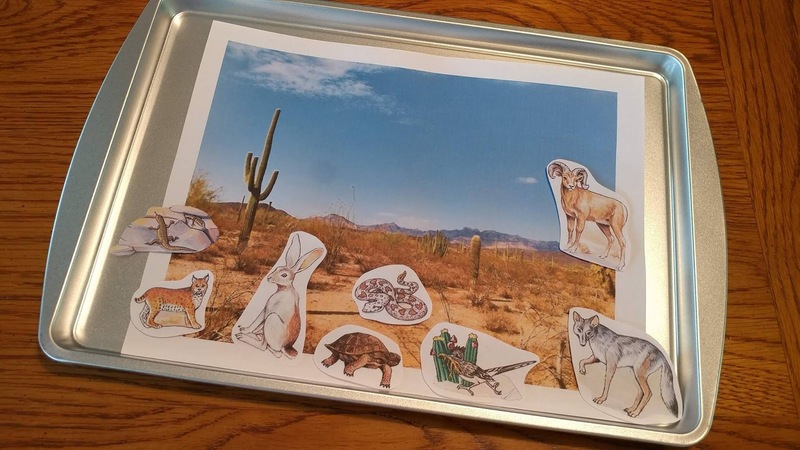 I'm in awe of your travel creativity. Have fun. That sewing machine is just about the cutest thing I've ever seen. I will be excited to hear about it. And just a touch jealous if you make a bunch of progress. Severe motion sickness limits my car activities to driving and sleeping. I hope that all of your games are a hit! It will be interesting to hear how they each fare with the kiddos. You did a ton of work to prep all of them! I want to be in the backseat of your car and play with all those awesome games and activities! I always wanted to be that kind of mom. Glad your kids get to have you. And hope your trip is/was awesome. Never in a million years would I think of a battery sewing machine to use in a car. I just switch to hand sewing or crochet. Interested to learn how it works for you. Fingers crossed. If you aren't a Super Mom I have no idea who is. 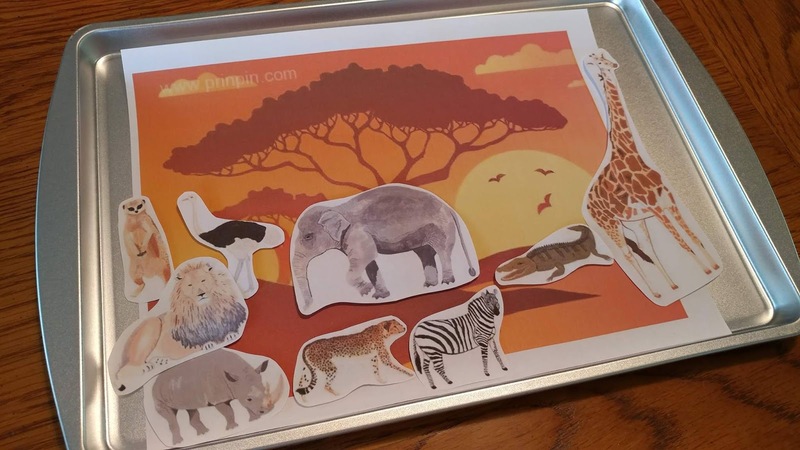 You made an incredible array of activities for the trip, and you know your kids so well that most of them were super hits! My "kid" is grown now, starting her third year in college, but man this made me nostalgic. Thanks so much for sharing on Wednesday Wait Loss. Made my day!